To educate the biomedical engineering leaders of tomorrow who will apply fundamental engineering principles to the responsible solution of problems in biology and medicine, to contribute to human disease management, and to bring engineering innovation and technology to the clinic while creating knowledge and enhancing global prosperity. have enrolled in an academic program pursuing a graduate, medical, law, business, or other professional post-graduate degree. Students may achieve these objectives through completion of the baccalaureate program leading to the B.S. degree. To ensure selection of the appropriate concentration and courses to meet individual interests and goals, students should consult their academic adviser as early as possible. The Biomedical Engineering Program at Rensselaer is accredited by the Engineering Accreditation Commission of ABET, http://www.abet.org. 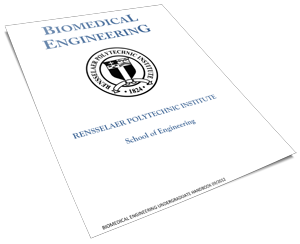 The Biomedical Engineering program at Rensselaer is accredited by the Engineering Accreditation Commission of ABET, http://www.abet.org.